SANRAL signs deal to further enhance the inclusion of black-owned enterprises in the construction sector. SANRAL and Barloworld Equipment Southern Africa executives from left to right: Lefa Mallane, Thabiso Malahleha, Ismail Essa, Skhumbuzo Macozoma, Emmy Leeka, Ramasela Ganda, Vasco Santos and Makhosini Nyoni. The South African National Roads Agency (SOC) Limited (SANRAL) and Barloworld Equipment reached a monumental agreement that will benefit emerging contractors in the construction industry. 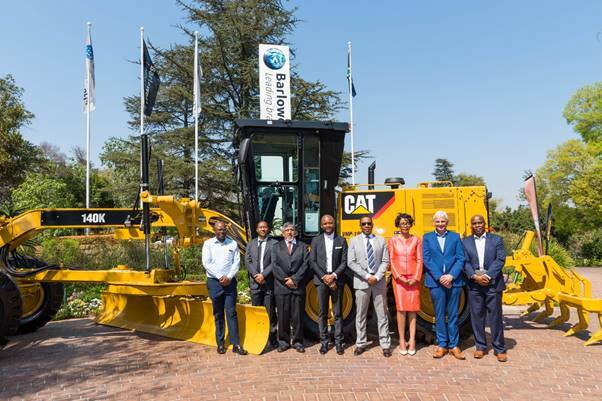 The agreement between SANRAL and Barloworld Equipment, the dealer for Cat earthmoving machines and Cat power systems in southern Africa, will allow black-owned enterprises greater access to equipment, financing and training, which will enable them to tender more effectively on road construction projects managed by the agency. Skhumbuzo Macozoma, the CEO of SANRAL, said: “This will open up the industry to new participants and remove many of the barriers that prevent companies owned by black, women and youth entrepreneurs to compete effectively against the entrenched players in the construction sector. This is the second Memorandum of Understanding between SANRAL and a top industrial company to support the growth of emerging contractors. Emmy Leeka, CEO of Barloworld Equipment southern Africa, said this is an opportunity to contribute to empowerment in the construction industry. “We have built valuable partnerships with black-owned enterprises through the years and this initiative will take our activities to a higher level,” said Leeka. “This will enable us to deliver on our incubation and empowerment commitments and work with SANRAL towards the greater goal to transform the engineering and construction sectors,” said Vasco Santos, Executive Head: Construction, Rental & Used at Barloworld Equipment. The Memorandum of Understanding sets out future co-operation between SANRAL and Barloworld Equipment across a broad range of activities, including providing small contractors in the SANRAL supply chain access to equipment, financing and training. Barloworld Equipment will set up structures that will enable contractors to benefit from options to lease or rent equipment. The company will also offer training to owners, employees and maintenance staff. Together, SANRAL and Barloworld Equipment will promote partnerships in the fields of training, fleet management, marketing and communication. Macozoma said the partnership is proof that SANRAL’s efforts to transform the construction sector and promote fair competition are delivering results. Lack of access to sophisticated machinery and equipment is a major barrier for small contractors and prevents participating in large construction tenders. Macozoma said: “By working together with established companies, we can remove these barriers and enable black-owned companies and enterprises owned by women and the youth to participate on a level playing field.